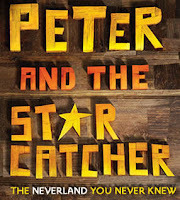 I caught a preview of Peter and the Starcatcher last week. The only preconception I had going in was from the press agent who invited me: "It's Peter Pan for adults." He was right, but it's so much more. I had a really great time at this play. I admit that I thought it was going to be a musical, but it's actually a play with music. It is definitely on the cusp of being a musical, with clever accompaniment which adds to the hilarity. The cast, packed with actors known for their musical theatre work, also gets the chance to present a couple of ensemble songs. When I was a kid, my favorite character of Peter Pan was Captain Hook. It was no different in this adaptation, or rather prequel. Christian Borle plays the villainous captain, known here as The Black Stache. He's known as "ruthless, heartless and peerless," but he's utterly hysterical and charming as he continuously breaks the fourth wall and bumbles his way through the action. He's joined on stage by a rowdy bunch of players, filling multiple roles of pirates, sailors, orphans and natives: Adam Chanler-Berat, Teddy Bergman, Arnie Burton, Matt D'Amico, Kevin Del Aguila, Carson Elrod, Greg Hildreth, Rick Holmes, Isaiah Johnson, and David Rossmer. Celia Keenan-Bolger gets to be the only female in this crowd and she more than holds her own. It is an irreverent prequel to Peter Pan, more or less explaining the who, how and why of the beloved fairytale. The show is a very physical and prop-heavy rout of an ensemble piece. I was very much reminded of the plays The 39 Steps, The Invisible Man and even Brief Encounter, all of which I loved. I think much of the humor was geared toward adults with it's current vernacular and pop culture references, but it is mostly clean humor and was certainly appreciated by the many children in the audience on the Saturday night we were there. There was a tween girl sitting next to me. She sat forward in her seat in order not to miss a moment and she repeated lines and laughed heartily at everything. It was great fun to sit next to her. Peter and the Starcatcher is playing at the Brooks Atkinson Theatre on 47th Street. Tickets are available via Ticketmaster.com or call 877-250-2929....use the code MAIL to get a nice little discount.